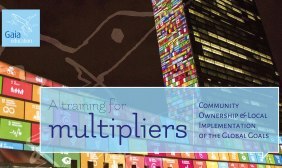 (13 March 2017) – Gaia Education invites you to join the vitally important conversation about how to accelerate the implementation of the United Nations’ 17 Sustainable Development Goals (SDGs) at the local and regional scale in ways that are carefully adapted to the bio-cultural uniqueness of your community. The ‘SDG Community Implementation Flash Cards’ contain more than 200 questions structured into the four dimensions of Gaia Education’s whole systems approach to sustainability (social, ecological, economic and worldview). Participants will explore these four dimensions of each of the 17 SDGs in question-focused small group conversations aimed at collaboratively identifying actions and strategies that will support implementation of the Global Goals. Your contributions will help to create local community ownership of the SDGs and ensure that implementation is done in ways that are sensitive to your local culture and ecosystems. The purpose of the training is twofold: 1)To initiate community focused conversations on local SDG implementation; 2) To train people to become multipliers of such conversations.